After midweek's international fixtures, & Zlatan Ibrahimovic sticking it to the doubters with incredible quality, we're back to the regular domestic action & we've gone for a couple of fixtures this Saturday. This game looks an ideal opportunity for a strong Leicester side to get back on track after a bit of a stumble against Ipswich who are still finding their way with new manager Mick McCarthy. Ipswich have won 2 of their last 3 but took a 5-0 beating away to Crystal Palace in between those wins that came in slightly uninspiring contests against ordinary Birmingham & Burnley. Ipswich's big problem is their lack of goals with just 13 all season & they've only scored more than once in a game three times, they're going to find it tough to break through here against Leicester who've only conceded 6 goals in 8 games this year & it's easy to see why with a solid back 4 & keeper. Kasper Schmeichel is gaining more consistency & the experience & quality of Paul Konchesky is unrivalled in the Championship plus the signings from Manchester United of Danny Drinkwater & Ritchie de Laet have been unqualified successes. Leicester are actually without a win in four games as they've come up against some decent teams in red hot Palace, improving Watford, underperforming heavyweights Bolton & hard to beat Nottingham Forest. If you go back before these last 4 games Leicester had won 8 of their opening 12 & will see this as the ideal opportunity to get back on track even with top scorer David Nugent a doubt with an injured neck for this one. Nigel Pearson will be confident his defence can handle Ipswich's lacklustre attack meaning he can commit resources forwards & Jamie Vardy should be recalled to the starting lineup alongside Martyn Waghorn & they can rely on good service from talented midfielder Anthony Knockaert. Leicester look a decent bet at odds of 4/7 & we like them to block Ipswich out & we'll take 7/1 about a 2-0 win too. In League Two, Northampton Town entertain Wycombe Wanderers at the Sixfields Stadium. Northampton are in mid-table whilst Wycombe are struggling down in 22nd spot & only staying out of the relegation places by goal difference. Northampton under the management of Aidy Boothroyd have been inconsistent so far this season but they have picked up seven points from their last three games with victories over Port Vale & Accrington Stanley. 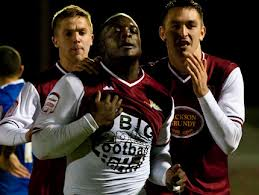 Goals aren't a problem for the side & much travelled striker Adebato Akinfenwa has come back into the side with a bang scoring a hat-trick last weekend to make it 9 league goals now. At home they are more than decent & have won four & only suffering defeats to current league leaders Gillingham & 4th place Bradford City. Wycombe are struggling & have lost nine of their 16 league games & haven't recorded a victory in their last five league games. In-experienced player manager Gareth Ainsworth has to deal with a side brittle in confidence & a whole host of injury problems. On the road they have lost five matches & have conceded just under an average of two goals per game. Northampton can prove too strong for a weak Wycombe side & continue their run up the table at odds of 10/11. Bug is ravaging trough Northampton side, Bayo may not start, youngsters are up to it but might not be the lineup you are expecting so not sure its a value call.